The last two books I read by Isabel Allende were The Japanese Lover and Ripper, both of which I didn’t really enjoy as much as her previous books such as The Sum Of Our Days, Island Beneath The Sea and Maya’s Notebook. Ripper in particular had a plot which left me in disbelief because the protagonist’s mother was in close contact with the murderer for a long time yet failed to suspect the person’s gender. 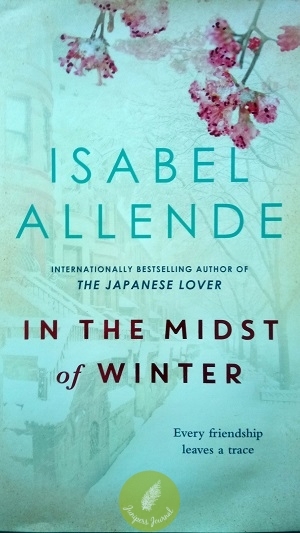 In The Midst Of Winter has a much better plot and I like the humour between the main characters, a middle-aged couple, Richard Bowmaster, a university professor and Lucia Maraz, an academic. The story takes place in winter of course, in New York. Lucia is Richard’s tenant and is freezing in her apartment with her dog when she is called by Richard to help translate for a woman who initially seems to speak only Spanish. Richard has had a car accident involving a young woman called Evelyn Ortega, a young undocumented migrant from Guatemala. What makes this story so interesting is that the story is told to us from the perspectives of each of the 3 people. We learn about Evelyn’s harsh life in Guatemala and how she found her way into the US to look for her mother. Lucia’s background is no less gripping as she had to endure the turbulence of 1970s Chile. As for Richard, he has a tragic story to tell as well. Evelyn Ortega comes to Richard’s door step after the car accident and reveals that she has a body in the trunk of her car which actually belongs to her employer. Evelyn works as a child minder. Richard, Lucia and Evelyn then go on a road trip to dispose of the car and body and during the process, Richard, Evelyn and Lucia get to know each other’s stories.